Newspapers and media outlets across the U.S. launched a widespread effort Thursday aimed at combating the constant attacks from President Donald Trump as well as negative feelings about the media's role in society. More than 300 newspapers around the nation joined together to each publish editorials that explained the role of journalists and amplified the positive role journalism plays in society. 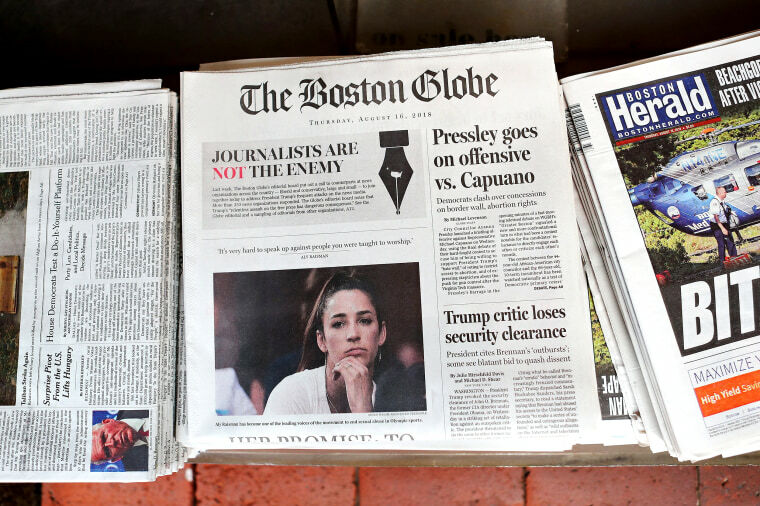 The effort was spearheaded by Marjorie Pritchard, deputy managing editor of the editorial page at The Boston Globe, who asked other editors to combat frequent attacks made on the press by Trump. So far newspapers big and small have joined the effort, and not just ones from blue states. They include The New York Times, The Arizona Daily Sun and The North Little Rock Times. The Topeka Capital Journal, a newspaper based in Topeka, Kansas, that supported Trump, joined in the coordinated action. “No one will be happy all the time with what a journalist or news outlet produces,” The Capital Journal editorial said. “But being called an enemy — and not of a politician or cause, but of the whole people of a nation — that’s something else entirely. It’s sinister. It’s destructive. And it must end now." Trump has targeted the media with criticism and accusations since early on in his presidential campaign, with those attacks continuing — and sometimes escalating — since he became president. At a rally in August, Trump described the press covering the event as "fake, fake disgusting news." Trump has made fun of the media by announcing a "fake news awards.” He’s also threatened to enact new libel laws and frequently attacked news outlets via Twitter. White House press secretary Sarah Sanders even declined to contradict her boss after he called the media the "enemy of the people." Trump fired back at the press on Thursday morning, tweeting: "THE FAKE NEWS MEDIA IS THE OPPOSITION PARTY. It is very bad for our Great Country....BUT WE ARE WINNING!" In subsequent tweets, the president pointed to the financial trouble of The Boston Globe and claimed that he supports freedom of the press but that "much of what it says is FAKE NEWS, pushing a political agenda or just plain trying to hurt people." Trump isn’t alone in being unhappy with the press. A Gallup/Knight Foundation survey published in June found that U.S. adults estimate that 62 percent of the news they consume is biased and that 44 percent is inaccurate. And Trump’s attacks are resonating with his base. A Quinnipiac University poll published on Tuesday found that 51 percent of Republicans believe the media is the enemy of the people. The same poll reported that 44 percent of American voters are concerned that Trump’s criticism of the media will lead to violence against people who work in media. The deaths at the Capital Gazette, a newspaper Annapolis, Maryland, in June demonstrated the openness of newspaper offices to the people in their communities. A deranged shooter killed five people on the staff after sending threatening letters. In an interview with The Associated Press, Pritchard explained her inspiration for the initiative: "I hope it would educate readers to realize that an attack on the First Amendment is unacceptable." "We are a free and independent press; it is one of the most sacred principles enshrined in the Constitution." The Las Vegas Review Journal, owned by casino owner Sheldon Adelson, also declined to participate, while still offering some support for the message. "We basically said he should tone it down, and feel free to point out instances where he has been unfairly targeted, but it's healthy to recognize the role the free press plays." Separately, the Radio Television Digital News Association has given the effort its support. Executive director Dan Shelley said in an interview that he spent much of Wednesday giving interviews to stations about the role of journalism in society. While many stations were open to interviewing him, some were not. One station based in Oregon told Shelley that the initiative might anger listeners while another in San Diego said it would not participate in any effort to attack the president, Shelley said. Another station in Michigan simply stated “internal factors” as a reason not to get involved.